Milby Class of 1960: "The Javelote" – Really!!! 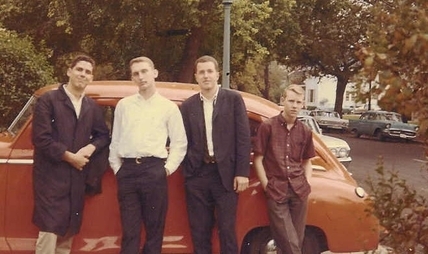 Here are some pictures of my "first car", from 1963 college days at UT Austin. My suite mates and I went together and bought this 1947 Plymouth from a little old lady who was the original owner. We paid $75 for the car which needed a paint job, the engine needed valves and rings and it had a hole in the muffler so you could hear it coming a mile away. Since I was the only one of us who was 21 I made a deal with the other three. Each paid $25 and I put the car in my name. One of the guys was a mechanic at heart and he went to the auto supply store and bought a few cans of paint, bright orange. 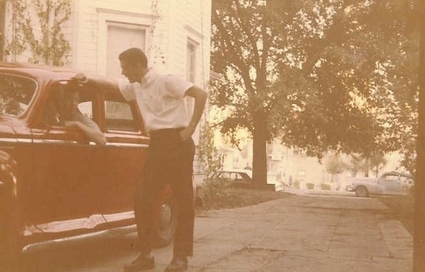 One afternoon and late into the evening, on the curb of the street in front of our rooming house, the four of us sanded down that car, by hand, and painted it using cheap paint brushes. It looked so "boss" that we took white tape and put a big UT # 1 made out of that tape on the trunk lid since UT was #1 in the polls. When we drove down "the drag" we really got attention. We would go to the corner gas station and buy a gallon of gasoline for $.16 cents and two quarts of used motor oil for $.05 Cents a quart. We poured the oil in the engine block and took off driving around campus. We could go an awful long ways on one gallon of gas at a time. I picked up my date one night at her ritzy private dormitory and when I walked her out to the parking lot, she saw that car and said "I wonder who is driving that monstrosity" to which I proudly answered as I flashed the keys in her face, "its me!". One of my suite mates was from Laredo and he decided we should call the car "The Javelote". When someone asked where the name came from we told them of the legend from the south Texas desert of a mythical creature that was a hybrid cross between a javelina and a coyote that roamed the desert at nights, i.e. "The Javelote". You would be surprised how many people believed that story, if you could tell it with a straight face, which I always could do. We drove it home on November 8, 1963, from Austin to Houston , in a blinding rainstorm for most of the way, with no windshield wipers. I was in the front passenger seat, looking at the roadway along the bottom of the windshield, under the inert windshield wiper, watching to see how close to the edge of the road my room mate was driving and telling him when to move back to the left to avoid going off the roadbed. This was before there was any interstate highway. The rain stopped about in Katy and we barreled on into east Houston . My roommate’s brother was getting married that night and he was to be the best man. The next morning, November 9, 1963 about 6:00 AM, we hopped back in The Javelote and drove back to Austin for the Texas vs. Baylor football game. There was a long line of cars headed to Austin for the game. You should have seen the looks of amazement when people in those cars passed us. That year was Don Trull's senior year Baylor and he was All American Quarterback par excellence. UT beat them by one point, when Duke Carlisle intercepted Don Trull's last minute Hail Mary pass into the Texas end zone, to seal our victory. Many years later, when I was in the insurance business, Don Trull was a client and I insured his construction company in Houston. I never did mention to him that I sat in the stands for one of his last college games rooting for The Longhorns. That's my story and I am sticking to it. Would you care to talk about the TU-TCU game that year? When Texas was #1? And beat Baylor? I remember it well...what a joy. But I don't remember seeing your ride. Would have known it was you. I remember the TCU - UT game of 1961 when Texas was unbeaten and the Longhorns were playing at home. The game was played in the freezing cold and there was ice an inch thick on those old wooden bleacher seats. The first drive of the game, UT was in a scoring position and the scatterback, James Saxton was running around right end at about the 30 yard line of TCU when he was upended and while flying through the air, upside down, someone kneed him in the head, knocking him out cold. After about five minutes he woke up and came back in for the next play but that hit took the starch out of the UT offense and they failed to score. I think the TCU quarterback was Buddy Iles and he lofted a pass into the end zone to his main receiver, whose name temporarily escapes me. TCU scored, but missed the point after. The final score was TCU 6 & UT 0. All the scoring took place in the first quarter, neither team could do anything the rest of the game. Sorry, I did get the year wrong but I think it was a pass from Sonny Gibbs to Buddy Iles that put 6 on the board. We (TCU) probably lost big time to Texas in 1963 thereby creating a big hole in my memory. Ray, reading your account of your "Javelote" kind of confirms the suspicions that us Baylor Bears have about the UT folk - kind of weird but usually in a nice way. I graduated from Baylor in 1962 and Karla and I moved to Colorado that summer so we missed the game you referenced. But, I did want to share some info about Don Trull that you talked about. He was a good friend of both Karla and me while at BU. He and I entered in the same year, were fellow math majors, and were both in Alpha Phi Omega. Karla and I were bereft of funds most of our stay in Waco. I worked in the library for $.50 an hour and we actually went all over campus at times collecting soft drink bottles and turning them in for the deposit to treat ourselves to pizza. Don somehow found out about this and would often treat us to pizza as I remember. So, he occupies a warm spot in our hearts for his generosity. He truly was a great guy, a great athlete, and obviously a man of great judgment because he selected you as his insurance go-to guy. Thanks for bringing up the memory. I am glad our memory thing - I can't recall its name - still works. And, who are you again? Hi Buffs! Ooops, I almost said "ole Buffs", but you're only as old as you feel. Sometimes with this warm weather and sunshine we're made to think of the beach or cutting the grass or, I know, taking the "Ole Betsy" out for a drive! I can still do most of those activities fairly well, but "Ole Betsy" needs some attention so I have to jump in my truck and run up to one of the "STREET MEETS" that the car clubs hold in various places around. I thought I would set my feelers out and just see how many of my fellow Buffs were still in love with their "Ole Betsys" and actively persued the open road in them. I have taken note of some who partake in the two wheel excitement, and that is great, but are there any who might still maintain a desire for the '40's,'50's and '60's JALOPIES we once drove. I would love to catch up with you at the next " Street Meet " in your area and even swap stories here on the BLOG. Just Fishing! 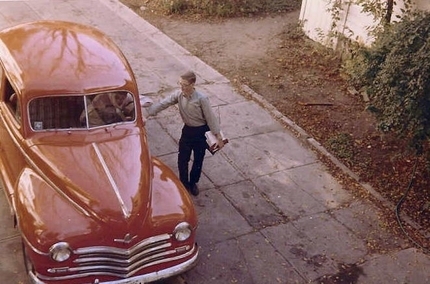 Your remarks brought back memories of my first car, the old Ford station wagon, 1953 I think, I bought for seventy five dollars, think they called it a "woodie" due to the wood sides. My brother recently told me if I had it today would be worth alot of money. Over the years if we kept a story on all our dogs and cats many of us could have written some great books. Told Ann Beatty one of my love stories yesterday. Strange how these memories can creep into our mind and bring back pictures of plesant times when we were young, stress free, happy with experiencing life and waiting for the next adventure around the corner. Retirement can again bring some of those experiences back because we have the time to meet new people and travel to new places. Many of us young at heart Buffalos have to deal with health issues and focus on diet and exercise as a way of life. Strange in 1960 we never thought about those things. Youth puts it off but age lets us know. Memories let us stop.......just a moment as we see pictures of your smiling faces standing beside your cars and we remember the way we were. We girls really thought you all were something. Hi Linda, my Uncle had a ' 50 Ford 'WOODY". He was laid-off from Cameron Iron Works and took up TV repair to make ends meet. He bought the " WOODY " to haul the TV's in. I remember it well as I Helped him, occasionally, to load some of the bigger TV"s.
Yeah, those old "WOODIES" are like gold today. As to " Love Stories ", sounds like you must have kept a "DIARY" ! What could possibly be written in one of those things ? Hi Karla, I currently have a '71 LWB Chevy " Cheyene 10 " pickup (GOLDIE). I drove her for a while to the "1960 Street Meet". There is just nothing like the smell of the old rods and the comeraderie of the guys who love them. It is just a togetherness like no other, with a simple purpose to " KEEP THE OLD (better) DAYS ALIVE. Now I've done it, I do not mean that these days are not just as great, and the kids nowadays have their favorite little "RICE BURNERS" and in days to come will hold them up then as we do ours now ! Go out and find a good car show/meet at a strip center near you and enjoy a " CHERRY COKE WITH COFFEE CREAM " soon. If you read my diary you would have to be killed. You would know far to much. Aha, the truth comes out about " DIARIES ",they are so secretive that they can only be shared with the most trusted of friends, who are apparently guilty of the same MISSDEEDS ( wrapping someones house ) as the diarist or is it just a girl thing ! I'll bet that revisited, some of those old entries are as vivid as when they were entered. WOW, what a way to get a rush ! You two keep the blog going. Wanted to hear some chatter from others. Memories may be a good topic. Just as the smell of the old cars brought back memories to Mike, I have one from Deady. Not a time goes by that I smell hot rolls, I remember the school lunch room, second floor I think. The Jukebox was playing Earth Angel by The Platters, eating hot rolls, butter and apple jelly. Lovesick at the time...... symptoms of this illness was a pain in the heart and sadness. Didn't keep me from eating those rolls! Mike, after mama snooped and read my dairy I didn't write in it anymore. So...... my memories will go with me when I am on the other side of the grass. Memories are being made by the Shoot Out Buffalos wish I lived closer would join them. Recently joined the NRA and attended my first gun show yesterday, I am a people watcher so yesterday was an experience. I also recently joined the NRA and they sent me a DVD " NEVER AGAIN " with my membership card. Did you get that DVD ? It was eye opening and EVERY RED BLOODED AMERICAN needs to see it. I bought my first pistol at a GUN SHOW, an old used FRENCH POLICEMAN'S sidearm it was, 9mm. I liked the feel of it and it fit my hand perfectly. Boy, they have some beautiful old guns at those shows. Some are totally engraved with silver and gold inlays and prices like a FERRARI ! Check it out and REMEMBER THE GOOD TIMES ! ! Oh Karla, I hope it is alright to put a URL on the blog, if not edit it off and I will understand. Hey guys, let's have some fun ! OK, Linda you must be having a "Senior Moment" because "Earth Angel" was recorded by the PENGUINS, not THE PLATTERS! It is one of the true classics of early rock & roll, kinda like BILL HALEY'S "Rock Around the Clock". I really enjoy the memories stirred up by some of our bud's posted here. Mike talking about his truck, Linda and her "woody". Just think guys & gals, if we had kept all the cars, motorcycles and other stuff (baseball cards) that have become so valuable, we wouldn't have to work so hard. I'm just as guilty as everyone else, traded, sold, swapped stuff, and gave some of it away through out the years. But, that's what makes us what we are, doesn't it! I received the upchucky.com Jukebox music from Ann and the 1955 year had The Platters listed as singers. Sounded like the version on the Jukebox in the Deady Jr. High lunch room. Maybe Kay Lawrence would remember. Kay was kind, quiet, and very pretty. Probably a card around her friends. Someone snitched on me for smoking on the bus. Called to the office and was confronted by Mr. Lawrence, Kays' dad, one of the principals at Deady . He told me I had to tell my parents. Sweated that one, I hem and hawed around until when I told my mother she said, "Is that all?" with relief in her voice. Stop smoking at age twenty-one and to this day my older son tells me my smoking is the cause of his allergies. I would encourage anyone to quit smoking. John, guess all the talk about guns reminded me about smoking guns. Got to get my permit haven't started packing.........yet. I'm afraid that John E. wins the "all expenses paid weekend" in beautiful downtown Beaumont at the exclusive, always fun and recently remodeled Motel 6. It was indeed the Penguins that recorded "Earth Angel". I too remember well that old jukebox in the cafeteria at Deady. The Platters, I'm sure were on it. Around that timeframe, it would most likely have been "The Great Pretender", My Prayer,or My Dream. Of course, they had many later hits, but those were their early ones. Tony Williams was the lead singer with the beautiful tenor voice that gave chills to listeners and dancers in one of our most influential periods. I never verified it, but I've heard over the years several different times, that when he died, he was working in a bus station in New Orleans......I'll research that for us. It was pretty common knowledge that those early doo-wop groups got severely hosed by the record companies. The Platters were one of them. Oddly enough, I too remember a particular song that played almost everyday on the jukebox. It was "Blue Velvet" by the original group long before Bobby Vinton's hit. I'm blank right now, but I want to say it was by "The Dells". I will also solve that puzzle....if anyone knows whether that's correct or not, please "weigh in". I'm usually pretty good at the musical trivia thing, but I'm content remembering what I ate for lunch these days. So good to chat with my old buddies! Sheila, You always were one of the most patient souls I ever knew. Thank you for the info. It was of course "the Moonglows" that were on the Deady juke box. I thought it was the "Dells". I had that same kind of absolute insight all the way through school. I remember sitting in the cafeteria mesmerized by those great doowop groups. I was so glad to see "Your Hit Parade" hit the highway.....it was time! There were so many really "standout" groups from '55 to '60 when we graduated. Remember the Clovers, the Drifters, the 5 Satins, the Crests, the Flamingos, the Cadillacs, the Del Vikings....on and on they went with the greatest music any bunch of kids ever got to dance and "make out" to!! Funny thing is, I really loved the Moonglows....don't have a clue why I'd forget about them....let's see now,...what were we talking about?